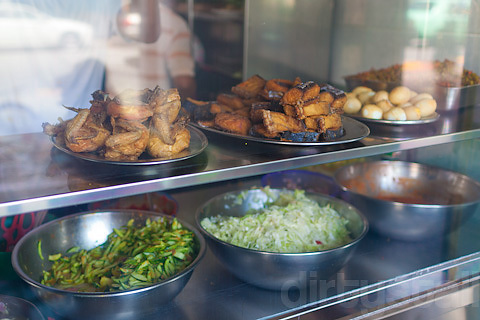 Padang food originated from West Sumatra and is pretty much the Malay version of our Chinese “economic rice”, and the food is characterised by the flavours of coconut oil, lemongrass, chilli and galangal. The family starts preparing food at 4am and the warong opens very early at 730am. 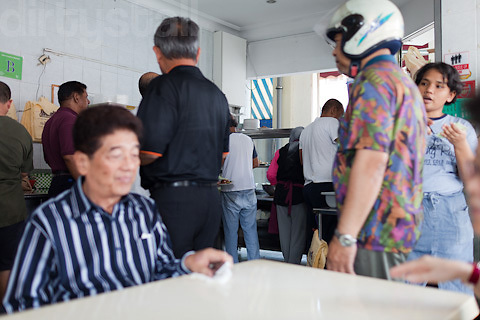 Once lunch time hits, the whole place becomes extremely crowded and you have to wait sometime just to get a seat. The dishes tend to run out pretty fast at lunch time due to the high demand so I didn’t manage to catch one of their signature dishes, the ayam bakar, which is barbequed chicken with a rich coconut curry sauce. The alternative was just the normal steamed chicken with the same curry sauce which is actually quite tender and tasty as well. 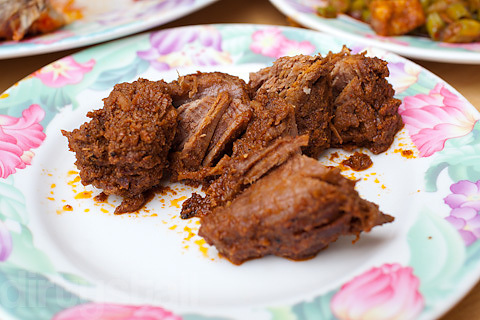 Their other signature dish is the beef rendang. This is absolutely delicious and the beef is so tender that you know they’ve used good cuts of meat and cooked it slowly for a long period of time. There is also a lemongrass hint to the gravy which perks it up subtly. 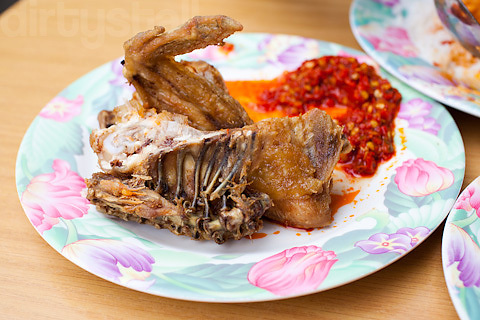 Their ayam goreng is quite nice as well, crispy skin on the outside and juicy meat on the inside. The portions are a bit on the small side though. 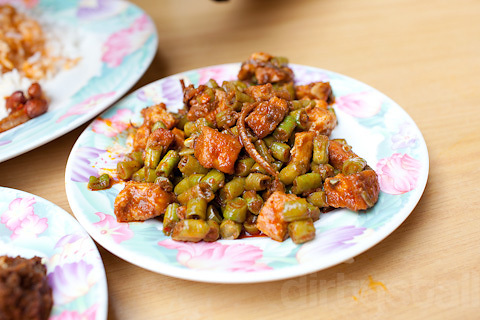 Another specialty dish is their sambal goreng, which is a stir-fried mix of long beans, tempeh and fried tofu. It’s not something that I’d eat but my friend tells me it’s excellent. And almost every table orders it as well so it must be pretty good. Warong Nasi Pariaman is definitely one of the best nasi padang stalls I’ve eaten at and if you’re in the area, you should definitely give it a try for a quick and delicious lunch! 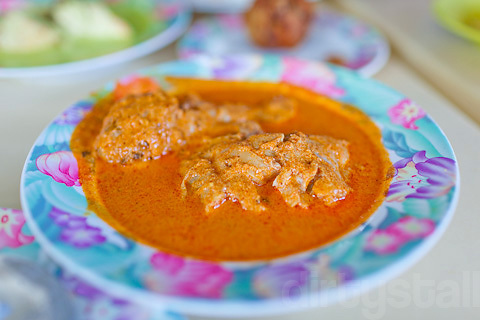 5 Responses to "Warong Nasi Pariaman"
Thanks for the recommendation. 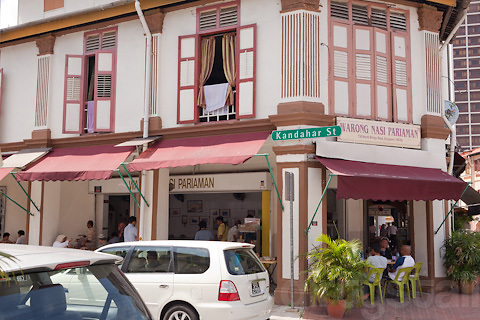 I saw your blog post and went to Warong Nasi Pariaman today as it is near my work place. The food here is real good! Thanks =)! You’re welcome 😀 Glad to know I’ve helped you to find another lunch makan place near your area!